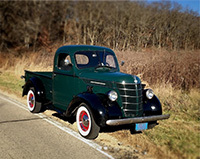 The idea for this article occurred in the fall of 2013 when my wife and I received our 1940 International D-2 half-ton short-bed pickup. On a warm sunny day after it arrived, I sat down in an easy chair with my favorite iced tea and a cigar and began to look deeply at the truck. I began to wonder what happened in the ‘30s to trigger the International D-Series design I had come to love. After all, IH’s preceding C-Series seemed to look like every other truck on the market. 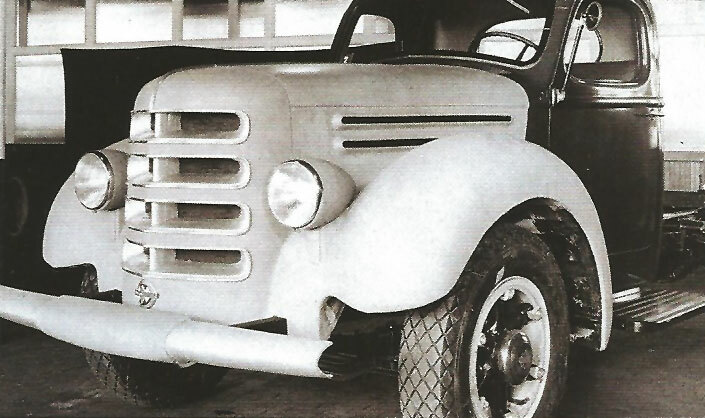 Who or what influenced the IH engineering department to produce this revolutionary-looking truck? What comes to mind when one thinks of “transportation design”? Of course, cars, airplanes, and trains. But what about trucks? Advancements of every sort of air and ground transportation have been chronicled in many ways, yet it seems that truck advancements have received less attention. This article will hopefully show readers trucks do have a place in automotive design and their roots parallel that of mainstream transportation design. To answer my question, I looked to the Roaring Twenties to see what was occurring in the art and design world. This was a time influenced by the Art Nouveau movement, but it also saw the genesis of the Machine Age in the United States. 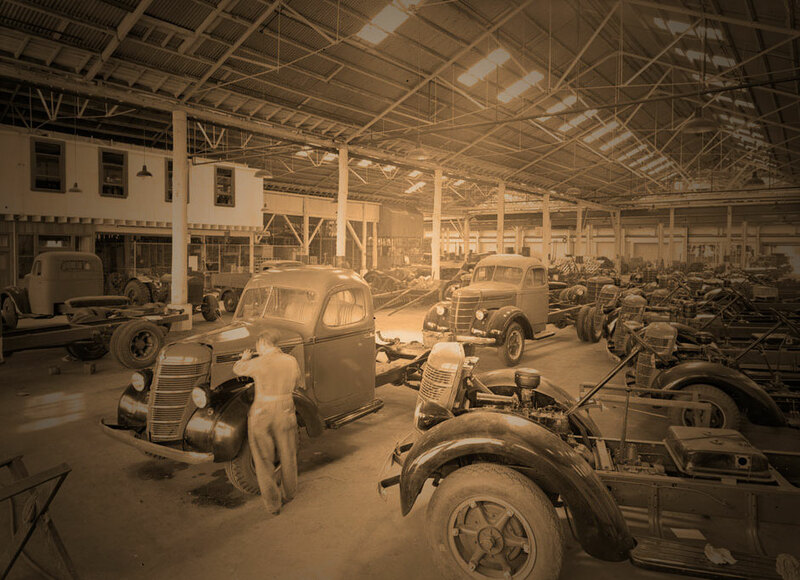 Automobiles made during this period were, for the most part, primitive and mechanically focused. Cars and trucks were utilitarian modes of transportation with flat radiators, flat windshields, and wooden spoke wheels. The Ford Model T and Model A trucks can be seen as good examples of the Art Nouveau/Machine Age truck. A new international design movement emerged around this time. The Art Deco movement rejected the ideals and forms of Art Nouveau and, instead, favored angular, symmetrical, and geometric compositions and incorporated Machine Age imagery and materials, such as aluminum and stainless steel. The term “Art Deco” actually didn’t come into general use until around 1967, when it was initially ascribed to the style popularized by the globally attended and widely acclaimed 1925 Paris exposition called the “Internationale des Arts Décoratifs et Industriels Modernes” (International Exhibit of Decorative Arts and Modern Industries). The term would later evolve into a broadly applied art label. 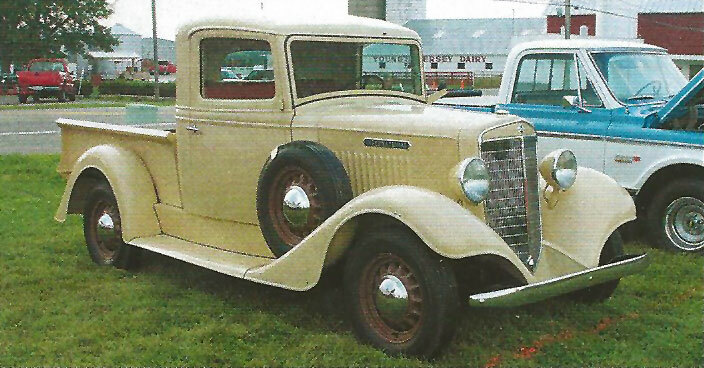 With a flat radiator and square cab, it is evident this 1935 International C-1 pickup, owned by Lloyd Boyer, preceded the Art-Deco-influenced D-Series. Leading into 1930, cars and trucks were yet to reflect the burgeoning Art Deco design. Automotive body design was guided by functionality and cost, and little importance was assigned to appearance. Many luxury-car manufacturers did not make bodies and opted to ship chassis assemblies to the coachbuilder of the buyer’s choice. The 1934 Chrysler Airflow sedan perfectly demonstrates the streamline and aerodynamic lines of Streamline Moderne design. The onset of the Great Depression left many millions unemployed and reduced the Detroit auto production lines to a very slow ebb. However, innovation was born out of the strife. Selling cars and trucks took some smart design and marketing. Manufacturers needed great-looking automobiles to catch the attention of the few who were able to buy a new vehicle, and so the concept of “product design” became a competitive necessity. Foreseeing the need to compete in automotive design, General Motors President Alfred P. Sloan created the Art and Color Section of General Motors and appointed Harley Earl as its first director in 1927. 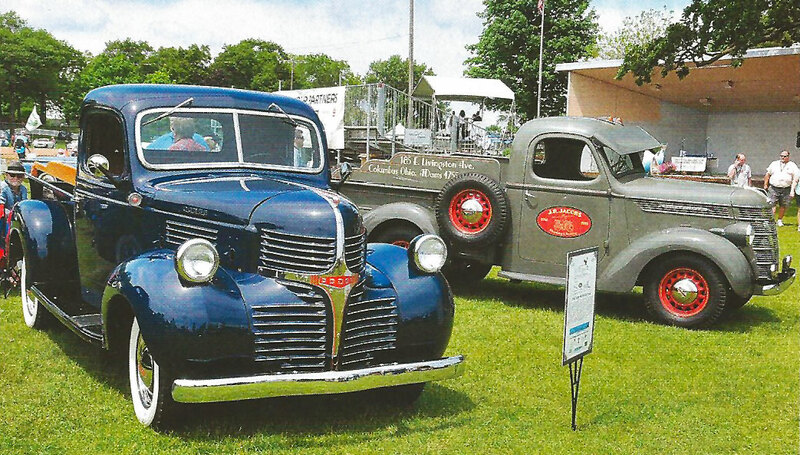 A well-matched pair, the ’46 Dodge WC half-ton and the ’40 International D-2 characterize the Art Deco movement popular during their time of production. The General Motors executives at the time – including engineers, division heads, and sales executives – viewed Harley Earl’s conceptual idea as flamboyant and unfounded. As head of the newly-formed Art and Color Section, he was initially referred to as one of the “pretty-picture boys” and his design studio as the “beauty parlor.” At the Chicago World’s Fair in 1933, a full-scale clay model of the GM Cadillac Aerodynamic Coupe was presented at the GM pavilion. By 1937, the Art and Color Section was renamed the Styling Section. Sloan eventually promoted Earl to the vice-president level, making Earl the first styling person to be a VP at a large corporation. Arguably, the 1930s produced some of the most beautiful product styling. Engineering departments were just beginning to experience the influence of modern aerodynamic principles developed for aviation and ballistics to reduce air friction at high velocities. Big leaps in design can be found not only in high-priced luxury cars, but also in trucks, trains, planes, farm equipment, building architecture, and even household items. The Pennsylvania Railroad sensed the changing times and hired an outside consultant, Raymond Loewy, to give their locomotives a new streamlined, modern look in 1936. The result was a fantastic departure from the Machine Age steam locomotives with steel-barred cowcatchers and a new aspect of Art Deco known as Streamline Moderne. 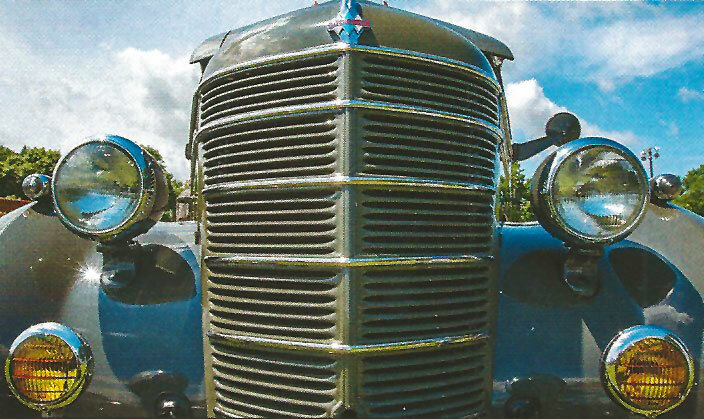 The nose of this 1940 International D-2 pickup, owned by Terry Jacobs, illustrates the elements of Art Deco, such as symmetrical, geometric patterns. Conceived by industrial designers, Streamline Moderne architecture and design reflected the tough economic times with stripped-down designs and simple aerodynamic curves. 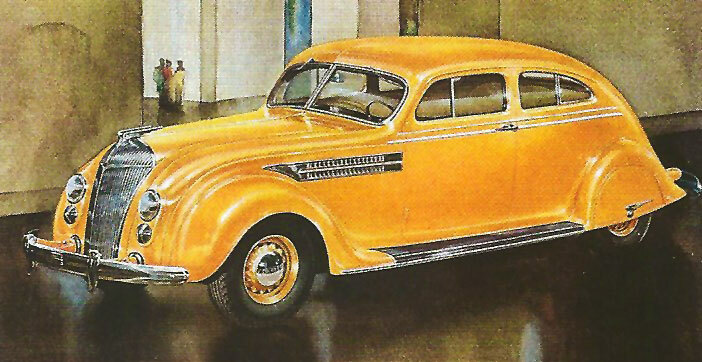 The 1934 Chrysler Airflow, designed by Carl Breer, is a good example of Streamline Moderne in vehicle design. But what does any of this really mean in relation to truck design? In the 1920s, trucks had flat radiators and a vertical, flat shroud. Their fenders were flat and followed the curve of the tire, their cargo spaces were boxes, and little decoration was used – a taillight was sometimes optional equipment. These trucks were utilitarian, but getting tired looking. As the 1930s progressed, cars showed this newfound style, sometimes in small ways, such as exterior body trim, radiator grilles, hood ornaments, dashboards, instrumentation, interior panels, and even seating. The Streamline Moderne and Art Deco design leaders also influenced the design changes to trucks during the mid-1930s. The Chevrolet, Hudson, Willys, Studebaker, Ford, and other auto manufacturers made leaps in design. Recently discovered pictures of scale clay models were found in the McCormick-IH collection, housed in the Wisconsin Historical Society archives. Attributed to Loewy’s design techniques, the clays, which seemed to be about 18 inches long, provide an excellent guide in the evolution of the D-Series truck. Although sparse in interior accouterments, the D-Series showed the transportation industry trucks were not to be left behind in design. 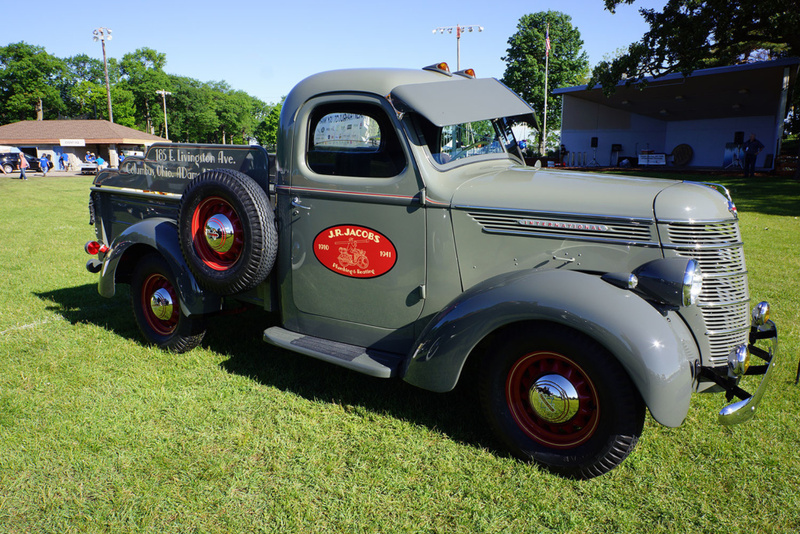 Terry Jacobs’ beautiful 1940 International Harvester D-2 half-ton short bed pickup. Terry informed me that the restoration took 9 months to complete.